Some sharply disagree with Bernanke’s assessment that the Fed knows what it is doing. Four years ago when you came before the Senate for confirmation to be Chairman of the Federal Reserve, I was the only Senator to vote against you. In fact, I was the only Senator to even raise serious concerns about you. I opposed you because I knew you would continue the legacy of Alan Greenspan, and I was right. 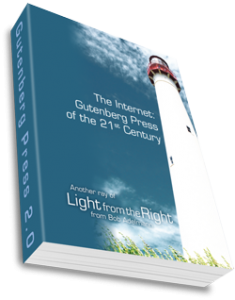 But I did not know how right I would be and could not begin to imagine how wrong you would be in the following four years…. You put the printing presses into overdrive to fund the government’s spending and hand out cheap money to your masters on Wall Street, which they use to rake in record profits while ordinary Americans and small businesses can’t even get loans for their everyday needs…You have decided that just about every large bank, investment bank, insurance company, and even some industrial companies are too big to fail. Rather than making management, shareholders, and debt holders feel the consequences of their risk-taking, you bailed them out. In short, you are the definition of moral hazard. 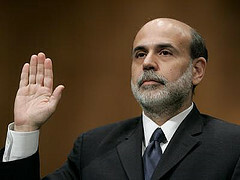 In early 2008 before Obama’s nomination, I questioned Bernanke’s character. He often testified before Congress siding with Wall Street’s Trojan Horse, Henry Paulson, the ex-Goldman CEO running the Treasury. Both minimized credit, currency, derivatives and economic problems. Later we learned he was misleading us about how bad things were, how long he knew. My conclusion: Bernanke cannot be trusted, he’s either a compulsive liar, or like Greenspan, Bernanke’s driven more by blind ideology than facts, research and the public good. Although Bernanke’s reappointment as head of the Fed (his term expires early next year) appears to be certain, a reasonable question must be raised: What would happen if Bernanke wasn’t reappointed? Or a larger question: What would happen if the Fed itself were abolished? With a stable currency, American exporters will no longer be held hostage to an erratic monetary policy. Stabilizing the currency will also give Americans new incentives to save as they will no longer have to fear inflation eroding their savings. This entry was posted	on Thursday, December 10th, 2009 at 6:21 am	and is filed under Economics. You can follow any responses to this entry through the RSS 2.0 feed. You can leave a response, or trackback from your own site.